Young actress is now trending in Twitter, but Why? Home » #RespectKathrynBernardo » #RIPKathrynBernardo » Kathryn Bernardo » Showbiz » Twitter » Young actress is now trending in Twitter, but Why? 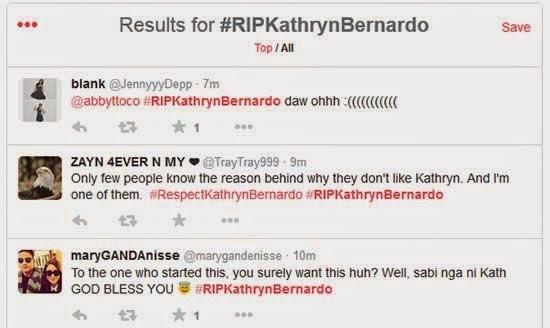 Young actress and singer Kathryn Bernardo is now trending on Twitter not because she is famous of course, but due to the hashtag #RIPKathrynBernardo which is gaining tweets for the past few hours today, April 1, 2015. We think this is part of the April Fools day but this is not a good joke, right? Many netizen thinks that the rival fans club love team are the reason behind this hashtag trending. But if you look to the old tweets about #RIPKathrynBernardo, it was started year 2013. It's way way back old and someone trending it again. But who? and why? 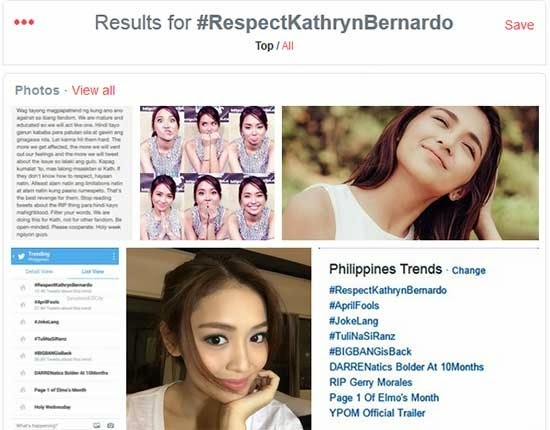 The good thing, this hashtag is no longer trending and has been replaced by #RespectKathrynBernardo. Many fans and friends are tweeting this hashtag and happily saying that the one with RIP thing has no longer in the Twitter topic. Hoping not to see that negative hashtag for Kathryn Bernardo because we believe that she really deserve the respect and everyone must be respected not only those celebrity but also we as Good Filipino of this country. Comments or suggestions about "Young actress is now trending in Twitter, but Why?" is important to us, you may share it by using the comment box below.